You have driven eastbound on Austin Bluffs Boulevard to make a left turn into the main UCCS entrance without the protection of a green arrow. You had the knuckle-whitening experience of crossing Austin Bluffs on a bike; facing six lanes of oncoming traffic travelling at over 50 mph. You walked across Nevada Avenue to get dinner in University Village after a long day at school, and then had to return to campus. You have tried to take Stanton Road between the north campus (where the 500 lots are) to the main campus instead of driving on Austin Bluffs and Nevada. If you can answer “yes” to any of these statements, then keep reading, because this concerns you and your safety. While the recent closure of Stanton Road at the behest of the Eagle Rock neighborhood accommodates the needs of residents; student and staff question the justifications for the gate at Stanton Road.These questions only raise more concerns about whether closing this roadway was in the best interest of the UCCS community. With the perennial debate on transportation at UCCS now further exacerbated by the closure of Stanton Road, the question of who was included (and not included) in negotiations to install the gate, and whether the University fell short in its commitment to break-ground on a replacement roadway comes to mind. Also, we must wonder whether the completion of a “Pioneer Road” may have prevented gate-gate entirely? According to the UCCS master plan from September 2012, a road was planned to connect the western campus, near the Ent and Lane Center, to the central campus: the missing Pioneer Road. Amidst this emerging debate, various community figures involved in this public road closure to report on the controversy chimed in with their thoughts. Skyler Digloramo, a UCCS undergraduate and founder of an online petition against the gate at Stanton Road, raises her concerns about student safety. “The closure of Stanton shows how little of a voice students have here at UCCS,” said Digloramo. Digloramo admits she will continue actively opposing the policy to shut down Stanton Road. “[The closure is] an unsafe policy for students and staff,”said Digloramo. Long time Eagle Rock resident Larry Yonker admits he has been supporting a project for the gate’s construction for fifteen years. While Yonkers is a long time proponent of the gate at Stanton Road, he agreed this was a complex situation with a host of concerns involved. Yonkers calls the University an asset. “Pioneer Road was discussed regularly in my meetings with Kroeger and Marsh,” said McDowell. This discussion raises questions about the progress of the phantom Pioneer Road mentioned in the UCCS Master Plan. Data information that the city collected to justify the shutdown at Stanton Road has yet to be released by the city. 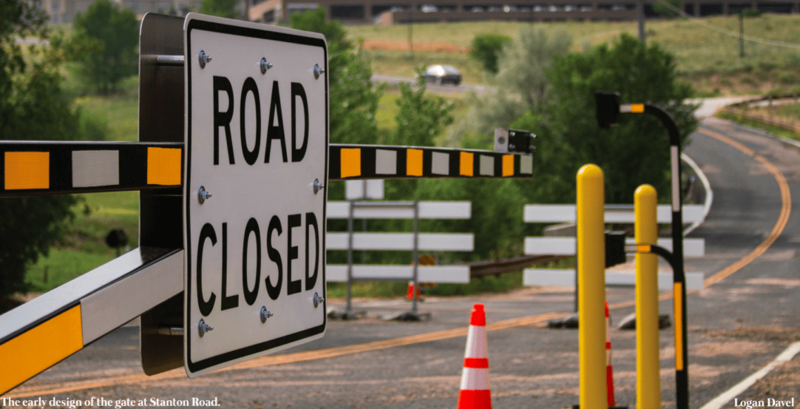 Jared Verner, the Assistant Director Of Communications at UCCS who wrote about the closure of Stanton Road in a July 26 article in Communique, discussed the closure and the progress of construction on Pioneer Road. Verner, admits to a sidelined role in what he described to be a joint UCCS and city venture to close Stanton Road since his involvement in February of 2018. The city’s participation raises a slew of additional concerns about the legality of the decision. As for the construction of Pioneer Road, Verner notes that plans for the road are moving forward because of the gate. The new internal road will be paid for using the University’s general fund” said Verner. However, he did not adequately address why ground has yet to be broken on the project to date. Although Verner offers little insight about the exact plans for Pioneer Road moving forward, he notes UCCS uses its master plan in a meaningful way. “There are avenues for students to voice concerns,” said Verner. Students can do this by emailing him or contacting your Student Government Association. Voicing concerns is encouraged with one critical caveat: you do so in a polite and respectful way. Whatever the juridical realities behind this closure may be, the closure of Stanton Road is symbolic of an endemic lack of dialogue between the greater UCCS community, the City of Colorado Springs, the UCCS Administration and the Eagle Rock Community. If the University is to move forward safely and seamlessly with its rapid pace of development while solving the problem of disconnection between the north and central campuses, it must do so within a framework of communication that includes its student and staff populations. In the case of the Stanton Road closure, no student or non-administrative staff had a voice in this process. The goal should be to demand inclusion in future planning decisions from the administration at UCCS because quite simply: these policies concern us, and student safety should be the first priority. With the Eagle Rock neighborhood at roughly 55 homes, and the fall enrollment exceeding 12,000 students based on the Fall 2017 Semester, the lesson we take away from the Stanton Road closure should be that our future expansion must be determined by a holistic community approach, rather than by loose-talk of promised roads, and exclusive policies that may endanger the already fragile safety of our student body. Be safe this semester, and speak up about changes that concern our student safety.